North-South Lake State Park is one of the most scenic landscapes in all of the eastern United States. It is located on the Wall of Manitou, the Catskill Front. 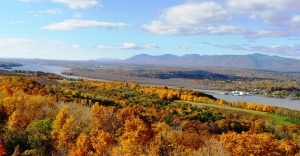 The “wall” overlooks a 70 mile stretch of the Hudson Valley – that makes for a lot of very nice views. The absolute best part of it is the Mountain House ledge. That was the location of the famed Catskill Mountain House Hotel which stood there from the 1820’s to the 1960’s. The hotel was located there because of the view. All sorts of people came to visit this very fashionable hotel, but mostly it was a Who’s Who of the American 19th Century: industrialists, businessmen, politicians, and so on. Other guests included some of the most talented of the country’s writers and artists. The Hudson River school of landscape art was founded here. Its artists prowled the nearby mountains searching for and finding wonderful views to paint. The hotel is gone but the view remains. Artists still come here and they still paint. Geologists come here too, many of them and often. We prowl the mountains searching for and finding wonderful geological histories. We look at the landscape and we can read its geological heritage. The signs are there. Epic stories of advancing glaciers compete with tales of ancient fossil forests. Petrified rivers flow across fossilized floodplains; it’s all there, if you know what to look for. Then there is the view from the Mountain House Ledge itself. We stand or sit and we gaze into the east. The Hudson River, below, has been there for possibly hundreds of millions of years. But that’s not enough time; we gaze beyond the river. There, all along the horizon, south to north, are the Taconic Mountains. Today they are a series of not terribly elevated mountains, hills really. They are pretty – not lofty, and scenic more than majestic. They are green all summer and, in that season, never white with Alpine snow. There are few superlatives to use when describing them, but they are nice. These “mountains” do not conjure up quite the same emotions as do their neighboring Berkshires, but . . . they are nice. To the mind’s eye of the patient geologist there is much to see from the Mountain House ledge. I planted myself there one summer twilight and slipped into the darkening eastern horizon. As the sun, behind me, retreated and the modern Taconics faded into darkness, I could see into the past. Out there it was a little more than 450 million years ago. I was startled to see a vast expanse of ocean before me. This is called the Iapetus Sea, sometimes also named the Proto-Atlantic. Its waters stretched all the way to the horizon. I watched as time flew by, millions of years of it. From time to time great eruptions were occurring just over that horizon. Something was happening out there. That something was a volcanic landmass and it was moving, very slowly. It was drifting eastward towards a collision with North America. I couldn’t see it yet, but something much the same shape, size and form as today’s Japan was crashing into North America. From time to time I could feel the rippling of the earthquakes that accompanied that collision. Then I could see more great plumes of soot rising above distant erupting volcanoes. There was a day when the peak of a rising volcano poked above the oceanic horizon and now, for the first time, there was visible land out there. I watched as more millions of years passed by. That small peak was joined by more and then many more. They coalesced into a single rising landmass. Something we call the Appalachian realm was in the process of being born – these were the infant Taconic Mountains. They rose and they rose. They erupted and they shook. Time, millions and millions of years of it, was compressed and speeded up for me as I watched a great mountain range rise to 10,000 feet in elevation and then quite a bit more. But then there was a new motion. The collision was far more advanced and now great thrusting motions shoved masses of rock westward and toward me. The earth shook violently with each of these shoves. I involuntarily took a few steps backwards whenever the motions were too strong for me to bear. I am a geologist and I knew what was going on, but still it was frightening to watch. Then, at last the Taconics had risen to their maximum. They towered above what would someday be the Hudson Valley. It was an awesome sight to view. And . . . then it was over. These mountains stopped rising. The great tectonic shoving had run out of steam. Now this towering landscape began to erode away. First it was a slow process and later the erosion accelerated. Enormous mountain streams clawed away at the steep mountain slopes and brought them down, inch by inch, foot by foot. 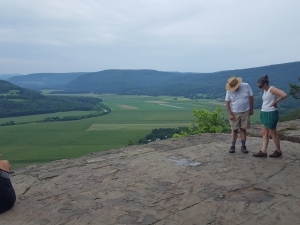 When you look south, down the Schoharie Creek Valley from the top of Vroman’s Nose, you will see a broad and very flat valley floor. In the Catskills this sort of thing is almost always the bottom of a glacial lake. That is the case here. 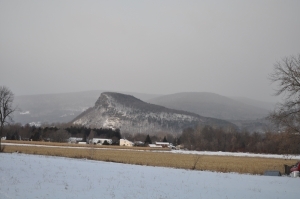 About 14,000 years ago a valley glacier filled the valley from Middleburgh to the north. That dammed the north flowing Schoharie Creek. See our second photo. It shows the glacier and Glacial Lake Schoharie. The waters of Lake Schoharie reached up almost to the top of Vroman’s Nose. That made it, for a time, Vroman’s Island! Most lakes have to have a place where they drain. In this case the waters drained off through the village of Franklinton. That’s on the far right lower corner of our map. Eventually the glacier melted away and Lake Schoharie drained to leave a dry valley floor, flat like the old lake bottom. Have you been to the trail that climbs from Rte. 23A at Bastion Falls to Kaaterskill Falls? It has been thoroughly renovated. Several small staircases have been added, but a very large staircase takes hikers around and to the right of the falls. This has been badly needed. Over the decades, foot traffic has been eroding into the slope, damaging it greatly. Take a look and see the trail as it was. Do you see how “pounded” it had gotten? Now see a photo we took just the other day (below). Looks a lot better, doesn’t it. 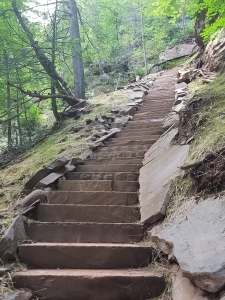 The new staircase eventually joins the Blue Trail and takes hikers to the top of Kaaterskill Falls. This is something that we have been wanting for decades. We plan to do a series of articles, in the Woodstock times, about this. This would have been our last column for Columbia Greene newspaper chain but they would not run it as we wrote it. This is our 385th consecutive week in your newspaper. We have been writing Windows Through Time for more than seven years. But this is also our last visit with you. The newspaper business has grown increasingly difficult and things change. We have no regrets and we are looking to the future, not the past. Still, we think we owe it to you to sum things up today and say good bye. What have we wished to impart upon you, our readers? We have been on some most remarkable journeys together. We have been traveling though half a billion years of history. Do you live east of the Hudson? Then most of the rocks around you are about 450 million years old. Take a good look. Do you see black shales and dark gray sandstones? Then you are looking at the Normanskill Formation. Those sedimentary rocks accumulated as sediments on the bottom of a very deep sea, The Normanskill Sea. You would have to travel out into the middle of the Pacific Ocean so see oceans this deep in today’s world – that would be the Marianas Deep. But you are not at the bottom of the Pacific; you are perhaps in Chatham. That’s typical of the journeys we have taken you on. Our column has always been about seeing our region in terms of what it has been like throughout time. Do you live in the Hudson Valley? Then look east and up at the Taconic Mountains. They are all that is left of a mountain range that probably rose up to elevations of 15,000 feet or so. Can you envision these mountains in your mind’s eye? Then you are looking through another “window through time.” Now turn west and look up at the Catskills. The mountains you see before you are a petrified delta. We wrote about this delta many times. It is science’s oldest known fossil forest. About 385 million years ago trees grew up there! In fact, there was even a tropical jungle up there. Now this is all gone. Except, of course, as fossils. How often have you driven west on Rte. 23 from the Rip Van Winkle Bridge? We took you there many times these last seven years. Great outcrops of gray rock tower above the highway. We have learned that these rocks transport us back through time about 400 million years. They take us to the shallow bottoms of the tropical seas that once covered all of New York State. We went to John Boyd Thacher State Park and saw the same inviting ocean. Our New York State once closely resembled today’s Bahamas! You learned that right here. Look out your nearest window. Use your mind’s eyes and see the deep ocean that was once right out there. You can see the shallow tropical sea and the jungles that were once there too. Ours have been wonderful journeys. If our land was once a tropical paradise, it was also an arctic wasteland. It doesn’t much matter where you are right now, look north then you can travel back through time and watch glaciers advancing toward you. Had you known that before? They reach us and pass us by. Eventually the climate warmed and they all melted away. That was the fun part as enormous volumes of raging, foaming, thundering torrents cascaded out of the mountains. Those waters created a lake that filled the lower Hudson Valley. Stand atop the hill at Olana and look down upon this enormous lake – another journey through time! Did you join us when we climbed up to the top of the Mountain House Ledge on a full moon January midnight during the Ice Age? Did you look down into the frozen Hudson Valley and see the moonlight reflecting off the ice? Well then you learned what our lives are like all the time. We enjoyed bringing you along. The world can be a dangerous place, even where we live. We traveled up and down the Hudson Valley and looked at many locations where landslides have occurred or are likely to occur. We felt it was important to inform you of these threats. Windows Through Time always sought to educate you, our readers about these sorts of thing. Will you miss us? Well we will still be around. Come and see us at the Catskill Interpretive Center on August 13. We will be at the Mountain Top Historical Center on September 10th, and we will be doing a Hudson Valley Ramble at Olana on September 24. Join our Facebook page and you will hear of other events. Follow our new blog “Thecatskillgeologist.com.” We are NOT going away.